This carefully crafted ebook: "Christabel & Kubla Khan: A Vision in a Dream (Unabridged)” is formatted for your eReader with a functional and detailed table of contents. Christabel is a long narrative poem in two parts. Coleridge planned three additional parts, but these were never completed. The story of Christabel concerns a central female character of the same name and her encounter with a stranger called Geraldine, who claims to have been abducted from her home by a band of rough men. Coleridge aimed to write Christabel using an accentual metrical system, based on the count of only accents: even though the number of syllables in each line can vary from four to twelve, the number of accents per line never deviates from four. Kubla Khan; or, A Vision in a Dream is a poem written by Samuel Taylor Coleridge. 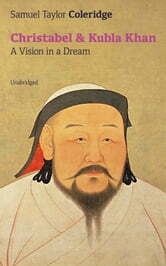 According to Coleridge's Preface the poem was composed one night after he experienced an opium-influenced dream after reading a work describing Xanadu, the summer palace of the Mongol ruler and Emperor of China Kublai Khan. Upon waking, he set about writing lines of poetry that came to him from the dream until he was interrupted by a person from Porlock. The poem could not be completed according to its original 200–300 line plan as the interruption caused him to forget the lines. Samuel Taylor Coleridge (1772 – 1834) was an English poet, literary critic and philosopher who, with his friend William Wordsworth, was a founder of the Romantic Movement in England and a member of the Lake Poets.